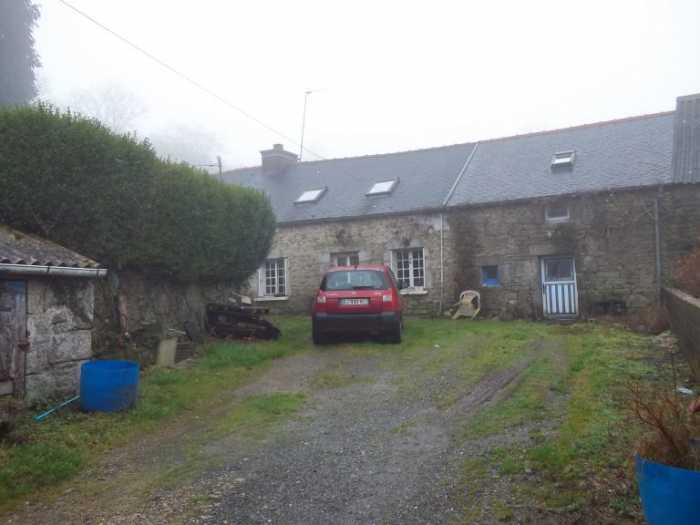 Properties for sale in Brittany, France - AHIB-3-M2204-2914975 3 bedroomed Longere to finish renovating with 852m² of garden in a pretty hamlet, close to Huelgoat! AHIB-3-M2204-2914975 3 bedroomed Longere to finish renovating with 852m² of garden in a pretty hamlet, close to Huelgoat! Located in a traditional hamlet of the Regional Park, in a cul de sac, this property offers a longere of 3 connected buildings. The structure is in a good condition, there is water and electricity, it is just habitable but needs still some work inside. On the ground floor in the main house there is a large room which is used as the lounge/dining with fireplace and wood burner, original beams, a spacious room, and there's also a WC. The staircase leads to the first floor where there are two bedrooms with velux windows, they need some decorative work. One of the extensions has been renovated, there is a large room used presently as a lounge, and upstairs is a large double bedroom. The other extension needs total renovation, it was planned to have the kitchen with another room above. At the entrance of the property there is a small garden with a little garden shed and a parking area as well. On the side of the longere there is a nice garden of about 852m². The location is very quiet, surrounded by lovely trekking paths. Once renovated it could be a lovely longere with nice character!